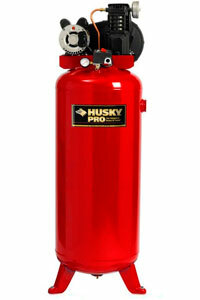 Husky 60 gallon Air Compressor is perfect to perform most of your tasks. It has a big 60 gal tank with a cast iron, twin-cylinder compressor pump. It offer 11.8/10.3 SCFM at 40/90 psi air delivery and maximum pressure 135 psi. Powerful 3.2 HP motor provides significant air to multiple power air tools. Twin cylinder, cast iron pump delivers 1070 RPM. Husky 60 gallon compressor is a stationary compressor, which means that it is much more difficult will be move than portable one. This 60 gal air compressor have oil pump therefore it require more maintenance than oil-free compressors. It’s recommended to have additional bottle with air compressor oil for them and if oil pressure in the pump will be lower then recommended by manufacturer, you should add some oil to appropriate level. If you are looking more info about Husky 60 gal air compressor then there is no need to explain to you how can be useful additional air tools like spray gun, nail gun, air hammer, etc. We sure that you know everything about them. This air compressor is usually used at small auto repair shops. For home use this compressor is not very practical, since it hasn’t wheels it will be quite difficult to move it through your workspace. It has a vertical space-saving design that is excellent for your work shop, garage, or home.